Steak-umm Twitter account gets verified. 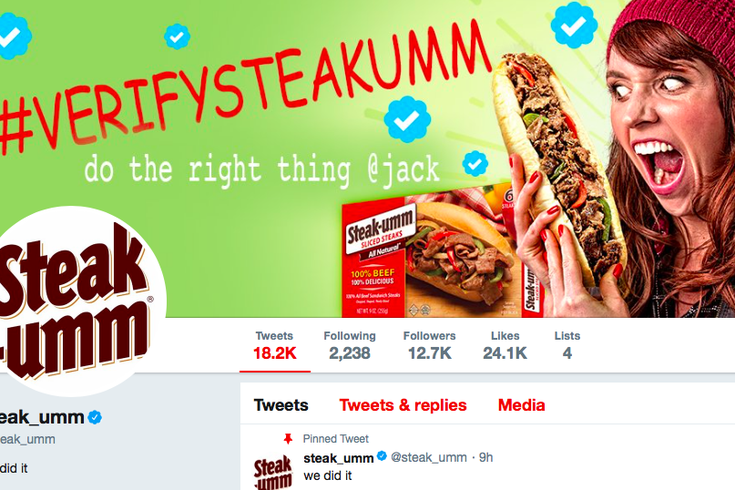 Back in January, Reading-based Steak-umm won a hard fought campaign to become verified on Twitter. The frozen steak company has become known for embracing oddball humor and building a social media following through memes, bad beef jokes and commentary on trending topics of the day. On Wednesday, Steak-umm broke through to a wider-than-usual audience on Twitter. In a string of incisive tweets, the company managed to analyze the alienation of young people through the very medium it claims is heavily at fault for the way they feel. And sneak in a few beef jokes while they were at it. While there isn't anything particularly groundbreaking about the message here, it is a little unusual to see a prominent brand verbalize how lots of people feel about the state of our social fabric. For a moment in time, a cheesesteak helper cut through the love-hate cycle of content consumption that has warped our neurotransmitters and exposed our cavalier, disgusting nature in comment sections everywhere. People from various corners of Twitter took notice of the Steak-umm tweet and praised the company's gesture, or at least acknowledged the semblance of sincere irony. Of course, a day later it was pretty much back to business. We'll see if Steak-umm Twitter lives up to its newfound status as a thought leader.